Special Guest Jim Hill holds an MFA in Writing for Children and Young Adults from the Vermont College of Fine Arts where he learned to write books with action, heart, and gobs of humor. 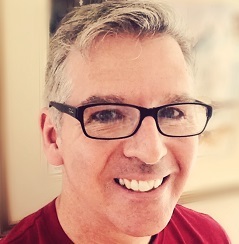 He has presented workshops and classes for the Arts Foundation of Cape Cod, the Cape Cod Writers Center, the Cotuit Center for the Arts, and the New England Society of Children’s Books Writers and Illustrators on topics ranging from writing picture books, to social media for authors, to writing graphic novels for non-artists. He is a regular contributor to the Project Middle-Grade Mayhem blog. Jim lives on Cape Cod with his wife and son within walking distance of an excellent playground, the village library, and his favorite ice cream shop. Hashtag, priorities. His upcoming middle-grade graphic novel celebrates nerd culture, cosplay, and putting bullies in their place. He is represented by Sara Crowe of Pippin Properties, Inc., but you can find him online at heyjimhill.com or on Twitter as @heyjimhill.